AAPL Apple closed at $307.47 on Friday, October 22, 2010, down from the all-time closing high set on Monday, October 18 of $318.00, set less than an hour before the Apple quarterly earnings announcement. Even with record quarterly revenues and net income reported on Monday, AAPL is down -2.31% for the week, but continues up +8.36% in October, up an incredible +45.91% for the year, and up an amazing +269.96% since the March 9, 2009 market bottom. This equates to -$7.27 for the week, +$23.72 for October, +$96.74 for the year, and +$224.36 since the March 9, 2009 market bottom. AAPL is down -3.31% and -$7.27 from the aforementioned 2010 YTD closing high of $318.00 on October 18. Apple has traded above $300 for 8 consecutive trading days. S&P 500 By comparison, the overall market, the S&P 500, is up +0.59% for the week, up +3.67% for October, up +6.10% for the year, and up +74.87% since the March 9, 2009 market bottom. SPX is down -2.81% from the April 23, 2010 YTD closing high of 1217.28. AAPL is outperforming the overall market long-term since the March 9, 2009 market bottom, outperforming the market for 2010, and outperforming in October. Apple underperformed the market this past week. A review of the S&P 500 (S&P 500 Ekes Out A Weekly Gain (Charts) *Bulls rally 3 straight weeks, 7 of last 8*) is here. Apple News and Fundamentals Apple reported record revenues and net income for Q3, which are reviewed and analyzed on this blog.. Current Apple financial data, charts, and review is at the Apple Financial Performance page, updated for the latest calendar Q3 results reported on October 18. A review and analysis of the most recent Q3 earnings call will be posted soon at the Apple Earnings Conference Call page. On Wednesday, October 20, the all-new MacBook Air was unveiled along with updates for the iLife suite, FaceTime for Mac, and a peak at the next OSX upgrade, Lion. Apple has launched in September both the iPad and iPhone 4 in China, the world's largest Internet market with a growing consumer base with disposable income. On September 1 with the Apple Special Event, CEO Steve Jobs launched new iPods, iTunes, iOS, and Apple TV. A summary and review of these announcements is posted here (Steve Jobs Unveils New iPods, iOS, iTunes, TV) and here (Apple Announces New iPods, iTunes, iOS, TV). Earlier, Apple launched the iPhone 4 in late June and the iPad in early April. International sales accounted for 52% of revenue in the latest quarter reported. AAPL Earnings per Share Earnings per share for the past 4 quarters have been: Dec09 $3.67, Mar10 $3.33, Jun10 $3.51, Sep10 $4.64 which totals $15.15. At the current AAPL price of $307.47, this is a PE of 20.3, which appears low. AAPL Cash Flow per Share Cash flow from operations for the past 4 quarters have been: Dec09 $6.29, Mar10 $2.52, Jun10 $5.18, Sep10 $6.12 which totals $20.11. At the current AAPL price of $307.47, this is a cash flow multiple of 15.3, which appears low. AAPL Stock Valuation Peter Oppenheimer, Apple CFO, stated in the October 18 earnings press release, “Looking ahead to the first fiscal quarter of 2011 (calendar Q4) , we expect revenue of about $23 billion and we expect diluted earnings per share of about $4.80.” Apple traditionally provides very conservative guidance. This would imply QoQ minimum growth rates of total revenues at +13.1% and earnings per share at +3.5%. More about AAPL stock evaluation in future posts, but the current AAPL price appears low. Our price target for AAPL is $400. Economic and Market News Information about the USA and world economies are posted at Boom Doom Economy and Financial Controls. AAPL Daily Chart Below is the AAPL daily chart since September 23, 2010 to illustrate just the price interactions with current close, resistance, and support. There is no previous price interactions, Apple has never traded this high before, above $300. A monthly chart is included at the bottom of this page for a broader perspective. Intermediate-Term Trend The intermediate-term signal, the comparison of the 25 day and 50 day simple moving averages, generated a buy signal on Tuesday, September 21. That is, the 25d sma is greater than the 50d sma. The relationship between these two moving averages is a lagging indicator and finally caught up with the amazing AAPL September Bull Run (+16.7%) that now continues into October (+8.4%). 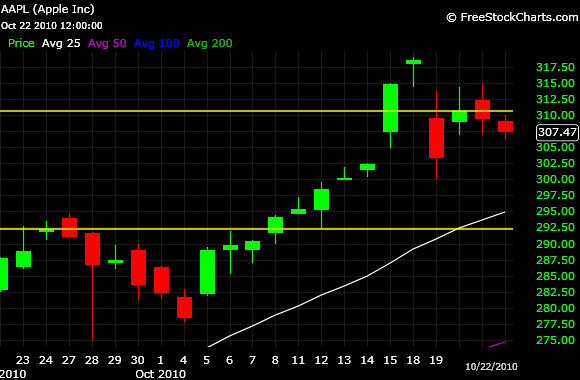 Resistance AAPL has pulled back from the all-time closing high of 318.00 on October 18, which is now final resistance. Current resistance is 310.00, specifically the 309.49 close on October 19 and the 310.53 close on October 20 (higher yellow horizontal line on the daily chart above). The all-time intraday high is 319.00 on October 18. AAPL attempted to pin through 310.00 on Friday, October 22 with an intraday high of 310.04, but failed to sustain and pulled back to close at 307.47. Support AAPL continues at lofty heights, above the summer trading range top, YTD lows, and 2010 pullbacks. Accordingly, there are multiple levels of support below. The 300.00 area is psychological and benchmark support. A prior all-time closing high of 292.32 on September 24 (the lower yellow horizontal line on the daily chart above) and the prior intraday high of 279.01 on June 21 are benchmark support. The prior all-time and 2010 YTD closing high of 274.07 on June 18, the top of the summer trading range, is also key support further below. Moving Averages AAPL continues well above all the daily simple moving averages (Only 25d sma shown on the daily chart this week): the 25, 50, 100, and 200. The 25d sma continues to ascend rapidly and is above the 50d, 100d, and 200d sma's. The 50d sma is ascending sharply and has regained the 100d sma, negating the August 31 Death Cross. The 50d sma continues above the 100d and 200d sma's and has regained the uptrend line (discussed below). The 100d sma is ascending and above the 200d sma. The 200d sma continues to ascend, indicating the overall trend is upwards. These moving averages are now spread out in a bullish fan. Uptrend Line (Not shown on the daily chart this week) The yellow uptrend line, a rate of price ascent, is from the January 20, 2009 closing low of 78.20 up through the February 4, 2010 cyclical closing low of 192.05. The January 20 closing low has been the bottom for 2010. AAPL dropped below this trendline on August 23, but regained it on September 3 and now has been above for 30 consecutive trading days. Downtrend Line Since AAPL is just below the recent all-time closing high of 318.00, there is no significant downtrend line. Relative Strength Index (RSI) The RSI 14 day = 77.74 is overbought. The multi-year and 2010 high was 97.49 on September 16. The 2010 YTD low was 21.49 on August 24. The RSI 28 day = 71.11 is marginally overbought. The 2010 peaks have been 84.63 and 83.79 on April 5 and April 23, respectively. The 2010 low was 38.25 on August 31. The RSIs have some upside room. MACD (12,26,9) The MACD = +0.26 and is downtrending. The September 22 MACD of +3.16 is the 2010 YTD high. The 2010 low was -3.55 on May 7. Previously the highest was on November 4, 2008 at +3.41. Volume AAPL volume was only 13.2M on Friday, October 22, the lowest since September 7 (12.2M). The 20-day moving average is approximately 22.7M. The 20d sma appears to have peaked, which is not encouraging for price support. The 50d sma is approximately 19.7M and also appears to have peaked. Overall, it seems the Apple Frenzy has abated for now. Long-Term Trend The 10 month exponential moving average of 251.85 is a long-term trend indicator and shown on the monthly chart below. That is the line in the sand, so to speak, for the long term signal of a bear market. AAPL is well above this signal at the current close of 307.47. AAPL is in a long-term bull market and has been since April 2009. Conclusion AAPL led the way during the USA September Stock Market Rally and continued to do so in October up to the calendar Q3 earnings report on October 18. Even with record revenues and net income, expectations were so high Apple did not confirm the 318.00 close before the earnings announcement and has pulled back. We believe AAPL did confirm the 318.00 close. More about AAPL stock evaluation in future posts, but the current AAPL price appears low. Our price target for AAPL is $400. The intermediate-term trend is bullish and the long-term trend is bullish. Up +293% and +$229.27 from January 20, 2009 cyclical closing low of $78.20! 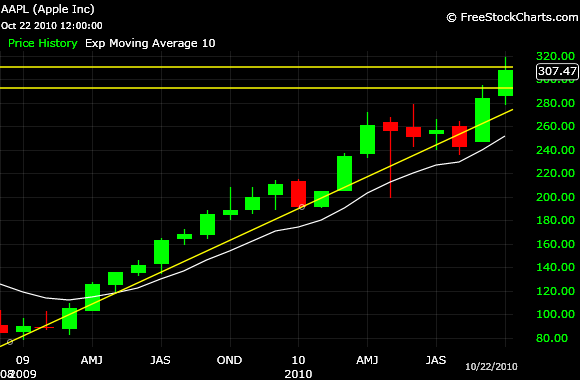 Below is the monthly AAPL chart since the January 2009 cyclical low. The overall analysis and commentary is the same as for the daily chart above. The current price, the yellow horizontal lines, and the yellow uptrend line are the same, and as described, on the daily chart above. The white moving average line is the 10 month exponential moving average of 251.85, which is the long-term bull or bear market signal. AAPL is well above the 10m ema with a close on Friday, October 15 of 307.47. AAPL has remained above the 10m ema since April 2009 indicating a long-term bull market. Apple Inc. achieved a milestone the week of May 24, 2010, passing Microsoft in market capitalization to become the largest technology company, and second overall largest company, in the USA. AAPL's market capitalization is now $280.89B, compared to Microsoft's of $219.61B. Exxon leads with $337.79B. Apple reported Q3 revenues of $20.3B and net income of $4.3B. For the prior Q2, Microsoft reported revenues of $16.0B and net income of $4.5B. Microsoft reports Q3 earnings on October 28. Current Apple financial data is at the Apple Financial Performance page. Apple is now 20.39% of the NASDAQ 100 index, as measured by the QQQQ ETF, weighted by market capitalization. AAPL is one of the most traded stocks in the USA. Per the SEC Form 10-Q, the Apple retail segment had 22,400 full-time equivalent employees at June 26, 2010. Per the SEC Form 10-K, Apple had 35,000+ full-time employees and 3,000+ temporary full-time employees at September 29, 2009. Apple's Mission Statement and described in press releases, "Apple designs Macs, the best personal computers in the world, along with OS X, iLife, iWork, and professional software. Apple leads the digital music revolution with its iPods and iTunes online store. Apple reinvented the mobile phone with its revolutionary iPhone and App Store, and has recently introduced its magical iPad which is defining the future of mobile media and computing devices." The problem is that the stock price is based on growth expectation. Everyone knows that the iPhone is a winner and although it demolished the consensus of about 12 million units the problem is the iPad - the other big future growth driver - didn't. In fact it was about a million units off consensus. Agreed, plus ultimately the earnings per share growth is being negatively affected by lower product margins. Mobile devices, especially smartphones, i.e. iPhone 4, don't have as good a gross profit margin as the Mac product line yet are increasing dramatically as a percentage of Apple's total revenues. Will post a chart on this soon. Thanks for your input!